Pros: This course will test your mid-range and short game with tough, narrow throw routes through trees. 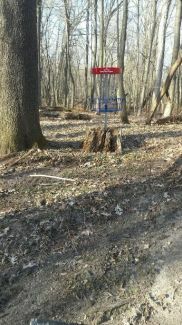 Excellent cement tee pads, signs and new Dynamic Disc Veteran baskets with red rims that are visible in dense woods. Large, well-done red signs help navigation by pointing out short and long tees. There are some additional course details such as gravel at Hole 11, a bridge crossing a marshy area at Hole 16, and neatly raked trails pointing the way to many of the baskets. Some lowland marshy hazards add some variety. This course is intermediate length from the long tees, but is more challenging than its length suggests. Not a crowded course when we were there, and appears to be a part of the park not used for other activities. A great choice on windy days where play at other nearby courses is more affected by weather. Hole 18 finishes the course with an epic downhill drive leading to a long trail bordering a low, wet area. Lots of woodpeckers and other wildlife. Cons: The entire course is located in dense woods, with few tunnel holes and no wide open holes. Some themes are repeated here from hole to hole, with some holes leaving a minimal impression. Occasionally the baskets are close together and may have you shooting at the wrong basket, though the signage helps this a bit. The lowland areas would make likely make this area very buggy in the summer months, and also means you might leave with muddy shoes. Other Thoughts: Despite being located in a flat area, the terrain bordering Cade Lake does provide some elevation changes and unique ridge side drives and upshots. Not sure whether or not this is a free course, but we left four dollars in the mail slot of the door of the park building just in case. A nice addition to an area with few other courses. Pros: Tough course will test your short game. Fun throw routes. Good signs and tee pads. Some rolling hills give this course some features besides just being a walk through trails. Cons: Some wet areas. No opportunities to throw hard. Other Thoughts: Fun course with some challenging aspects. Good fun factor. Watch for the wet area past the tee for Hole 15. Pros: Lots of elevation change. Good layout. Some time ,effort, and $ put into this course and it shows. Will only get better as gets broken in little more. Other Thoughts: Like the rough finish on pads. Nice signs. The rough is pretty rough in places but will get better with more action on it. All in all great course! Other Thoughts: I really like this course! The course designers did a good job making the short tees fun for more experienced players but not too punishing for newer players. The property the course is on also includes a modern campground on Cade lake so that is also a bonus!